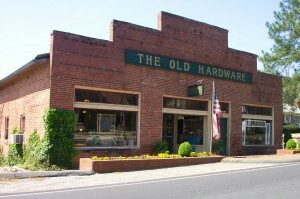 If quality antiques are your passion or your trade, you will not be disappointed with a visit to The Old Hardware. Having been in business at this same location for more than twenty years, The Old Hardware has established a reputation for offering outstanding country and formal furniture and accessories at reasonable prices. Ranging from blue-decorated stoneware, pottery, and painted furniture to Staffordshire, Imari, and period English pieces, our inventory is sure to please the discriminating buyer. The restored 1920’s brick building, once the center of Cameron’s agricultural trade, lends itself to inviting displays in a vintage atmosphere. With two floors of Antiques to browse, a visit will surely be a memorable experience. Located in the heart of the Carolina Sandhills, home of the long leaf pine, world-class golf and top equestrian activities, Cameron, North Carolina is a small farming town, proud to be included in the National Register of Historic Sites. Born of a Plank Road, nurtured by a Railroad, and spurred on by the turpentine and dewberry industries, Cameron prospered in the late 19th and early 20th centuries. The dewberry industry played an important role in this prosperity. Hundreds of acres of Dewberries were cultivated and shipped by rail to northern markets where, being larger and sweeter than a blackberry, they were very much in demand. Cameron hustled and bustled during the busy harvest seasons. All hotels were filled for auctions and fairs, and the town lived up to its name, The Dewberry Capital of the World. Though the trains no longer stop as they pass through the town and dewberries are not grown on a large scale anymore, Cameron has become a destination for serious collectors, decorators, trades persons, and those just interested in local history. Cameron was voted “Best Antique Area in North Carolina” by Our State Magazine, and “Best Antique Area in Moore County” by The Pilot Newspaper. Also featured in Southern Living Magazine, Cameron boasts twelve antique shops and is well worth the visit. Plan your trip soon to spend the day, enjoy lunch, and have a great antiquing experience. Learn more about the antique shops of historic Cameron.